The final numbers are out. An absolutely stunning tribute to what to genealogical community can do when it decides to do it. When The Legal Genealogist picked up the ball on the planned walk-to-raise-funds at the Federation of Genealogical Societies’ 2014 Conference in San Antonio, all I was thinking, frankly, was making it possible for maybe 10 or 15 folks who couldn’t attend to add their voices by sponsoring someone who could participate in the Saturday morning walk to the Alamo. 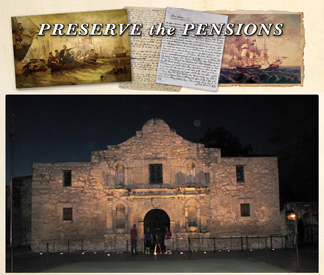 The goal, of course, was to raise funds for the Preserve the Pensions campaign: the effort to raise funds to digitize and thus permanently preserve some of the most fragile and genealogically significant records that exist — the records of pension applications from the War of 1812. The end result of the project will be to make full color reproductions of these documents available, free, forever, online. Even when the plan changed to a Celebrity Walk (I got to walk along with the Genealogy Roadshow stars Josh Taylor and Kenyatta Berry and FGS conference co-chair Ed Donakey), I thought, perhaps, we might bring in a whopping big $5,000 — which, with matching funds first from FGS and then from Ancestry, would become $20,000. The immediate response was overwhelming. So I raised my sights. Could we possibly bring in $12,500 in contributions and, with matching, break $50,000 for the whole campaign? It looked just barely possible. We broke $50,000 just looking at the online contribution totals. And now we have the final numbers. I am so very grateful for everyone’s support. Preserving these fragile and genealogically invaluable records is such a good cause. And these final numbers are heartwarming. Except that those aren’t the final numbers. Even yesterday, The Legal Genealogist received another $50 via PayPal from a reader in South Africa. South Africa, for cryin’ out loud! Keep it up. Keep it coming. Get your society to join in. Do something special at every event you organize. But I have no doubt we’ll make it. Not only is this an example of genealogist giving back to help others but it is a demonstration of respect that we all have for you. You are the type of leader who can motivate others. You not only try very hard to educate us as to how we can be better researchers but you help to show us how you can respect the rights of others while conducting our research. Your talks are not designed to impress the audience with your knowledge but to inform us how to deal with some part of the research puzzle. I guess this is our way of saying “Thank You” for what you have done for the genealogy community. Harold, you’re going to make me cry. Thank you so very much for those far-too-kind words! Harold no truer words have been written! Thank you Judy! Aw… thank YOU and the whole community for pitching in here! Thanks, John — but the big kudos go to all the contributors! It was a wrong made right! BIG time, for sure, John — the community really pitched in! Glad I could help at least a little. Don’t want to rub it in TOO badly to the “kids,” Nancy — but the fact is, age wins out over youth here!! And we all appreciated the support from all of the community. Awesome! And, aren’t you glad you woke up at “oh-dark-thirty”? 😉 I’ve only been reading your blog a couple of months, but you inform and inspire us! So, I agree with Harold… And, it is a great cause! One of my 5X great grandfathers fought in the war and I want to preserve these records! Thanks for your help in spreading the word! I’m so glad I can play any role in helping out with this effort, Dana, but the real credit belongs to everyone who contributed!